When your child turns into a toddler, he or she may start to resist doing things that he or she may have previously enjoyed or been fine with. This includes picking up toys, getting dressed to go out, and brushing their teeth. They do this to test boundaries and to figure out what is and what is not acceptable in the world. Offer A Reward: For a toddler, this doesn't have to be anything huge. A sticker or letting them help pick out tomorrow's outfit may be all the encouragement that they need. They may be so excited about this prospect that they'll start reminding you instead of you reminding them. Encourage Honest Efforts: Although your child should obviously be spending more than 10 seconds brushing his or her teeth, that's still a good start if they've been completely refusing the task. Each day, challenge them to brush a little longer by using a timer ("Let's see if you can keep brushing until this beeps!") or by coming up with a silly song to sing while brushing. Brush Your Own Teeth: If you always brush your teeth after your toddler has gone to bed, he or she might start to feel that they're being punished in some way. Brushing your own teeth at the same time models good dental hygiene and shows your child that they're not alone in having to brush their teeth. Buy Separate Toothpaste: Children can have vastly different taste buds than adults, resulting in a different experience with the same flavors. The toothpaste that you find to be pleasantly minty may taste vile and disgusting to your toddler. Look for toothpaste formulated for children and, if possible, let him or her choose the flavor. You may think that cherry toothpaste is gross, but your child may think it's the best thing ever. Let Them Pick The Toothbrush​: Light up singing toothbrushes may or may not be a gimmick to entice kids to buy them, but they can be extremely effective at getting your child to brush. Turning brushing time from a chore into playtime can mean the difference between telling your child to brush and them telling you that they want to brush. If you don't want to spend that much money on a new toothbrush, at least allow them to pick out their favorite color when buying ordinary toothbrushes. Enlist The Help Of Their Dentist: Young children may not always want to listen to mom or dad, but they may want to go out of their way to impress other adults in their lives. If your child is in awe of his or her dentist, let your child bring along his or her toothbrush to show the dentist how well they do at brushing their own teeth. Your child's dentist may also have other suggestions specific to your child. Encouraging good dental hygiene now is the key to your child having healthy teeth for their entire lives. If your toddler has never had a dental exam or if it's been more than a year since he or she last went to the dentist, make an appointment today. 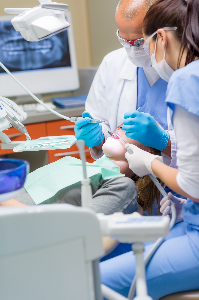 The sooner that dental problems, if there are any, are caught and corrected, the easier the whole process will be for both you and your child.